On the Kennebec River at the northeast end of Arrowsic Island. Private residence. Best if viewed from one of the boat tours out of Boothbay Harbor. Doubling Point Light, sometimes referred as the Kennebec River Lighthouse, was established in 1898 on a sharp double bend around Arrowsic Island on the Kennebec River, near the shipbuilding harbor of Bath. From 1898 to 1935 the station had only two keepers staffing the lighthouse itself. In 1935, the keeper's house was sold to a private owner and the keeper at the Doubling Point Range Lights (Kennebec River Range Lights), Station a short distance away became responsible for both stations. Then from 1981 on, one keeper was assigned to look after the Doubling Point Range Lights, Doubling Point Light, and Squirrel Point Light. The rotting wooden tower and foundation at Doubling Point was repaired with foundation repaired in 2000. Historic Bath is a leader in the ship building ports in New England. Although a military installation, there is a park nearby to relax. You can also visit the Maine Maritime Museum to explore and take in one their many types of lighthouse cruises and nature excursions. Other tours from the Bath area also pass by the lighthouse. Check out their lighthouse lantern room coming summer of 2017 as an exact replica of Cape Elizabth lighthouse, to see exactly wat the keeprs did, in different types of new England weather. 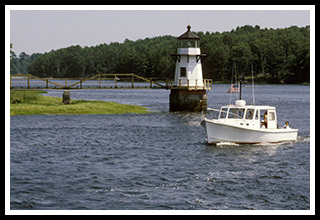 Captain Fish’s out of Boothbay Harbor has many tours weekly to the Kennebec River lights. Before going over the bridge at Wiscasset that heads towards Boothbay, you’ll find Red’s Eats snack shack, just look for the line of visitors. Red's is best known for its packed tasty lobster rolls and fried clams. The building is an actual lobster shack, and has been a staple for visitors since 1938. After crossing the huge Kennebec River Bridge in Bath, travel down 127 and you’ll find a mile hike out through marked wooded trails to Squirrel Point Lighthouse. You can also find Doubling Point road and can ask permission to explore the Doubling Point Lighthouse, and the Doubling Point Range Lights across the street. There are plenty of boat tours out of Boothbay Harbor to view the lighthouse from the river. Stop at Reid State Park, which has the honor as being Maine’s first state-owned saltwater beaches, which stretch out over a mile. You’ll also find large sand dunes, sweeping views of islands and lighthouses, and lots of nesting birds. Be wary this is a private residence, better views may be obtained from one of the many tours offered in the area. Take Route 127 South for nearly 2 miles till you come to a dirt road on the right with the sign that reads "Doubling Point Rd." Then bear right at the fork to reach Doubling Point Light; if you bear left at the fork you will come upon the Kennebec River Lights or what are also known as the Doubling Point Range Lights. Both of these lights are in a residential area and the people who live at these places will probably allow you to take photographs. Ask permission if you can. Boat cruises mentioned below offer many types of cruises. During specific lighthouse cruises, they may pass by Doubling Point Light. They may also pass the lighthouse as part of charters, narrated wildlife and historic tours, whale watching, fishing tours and other types of excursions. 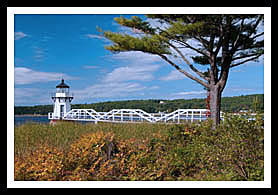 Includes lighthouses along the Kennebec River and Boothbay Harbor. Chartered pontoon boat for lighthouse excursions. 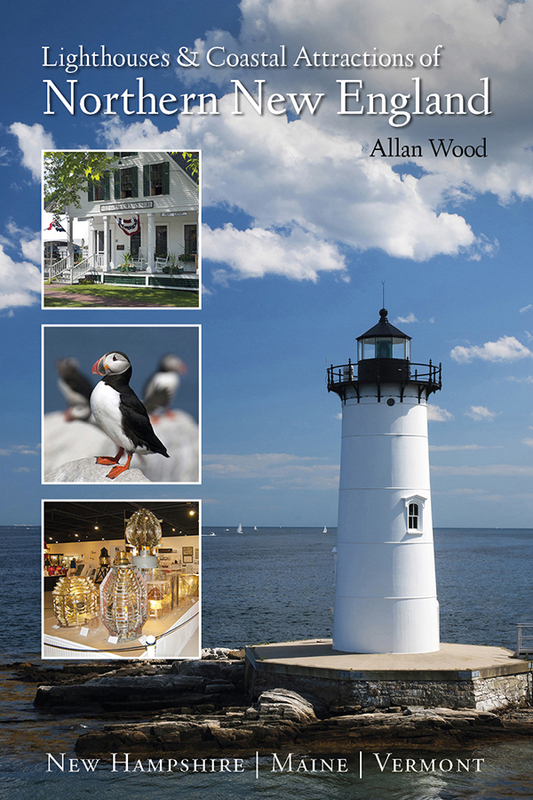 My 300-page book (with over 360 images), Lighthouses and Coastal Attractions of Northern New England: New Hampshire, Maine, and Vermont, published by Schiffer Publishing, provides human interest stories from each of the 76 lighthouses, along with plenty of coastal attractions and tours near each beacon.